A mindset is an attitude or disposition that determines our responses to and interpretations of particular situations. It is shaped by our beliefs and experiences. Think of mindset as the way we approach and deal with particular situations. Early research suggested that our mindsets were fixed, which links to the beleifs that our intelligence is also fixed. 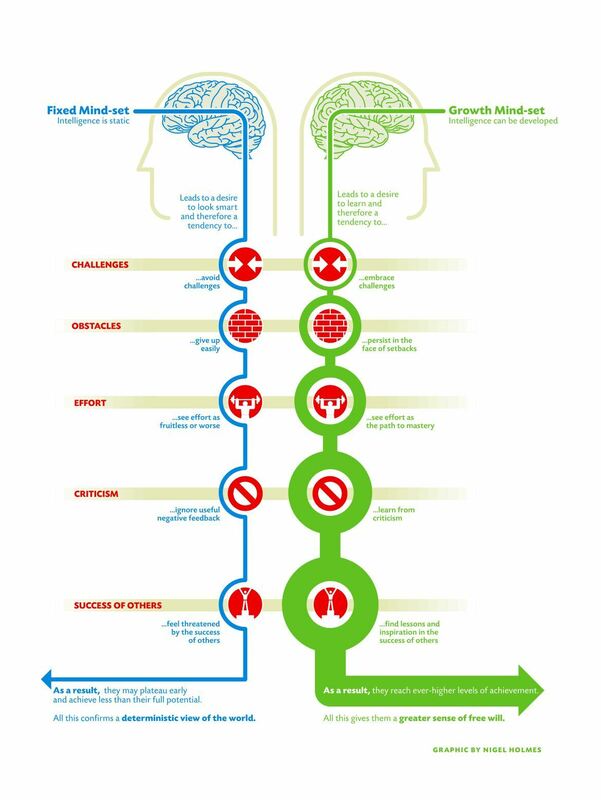 Recent studies by Carol Dweck and others have shown that mindsets and ability are not fixed. Just as you can build up your physical muscles and become stronger, you can develop your mental ‘muscles’ to become a better learner and thinker. Developing a growth mindset helps you do this. View the resources below for more. What mindset do you have? Take this confidential survey to find out. Look at the five elements in the diagram above: challenges, obstacles, effort, criticism, success of others. What is one simple change you could make under each element to help you develop a growth mindset? Do you know anyone who has a growth mindset? What are some of the habits or rituals they have in place?